When we set a date for our wedding I wanted an unusual bouquet and typed this into my search engine. Jamball was my favourite and I enquired though their website about prices. I was so happy with their service and prices that I ended up with my beautiful bouquet, three bridesmaid's bouquets, a flower girl wand and four button holes with a Banksy theme. I loved every moment of choosing things to go on the bouquets and picking things on Pinterest. Jaime and Pete really got me and my style and I looked forward to every step of putting the bouquets together. 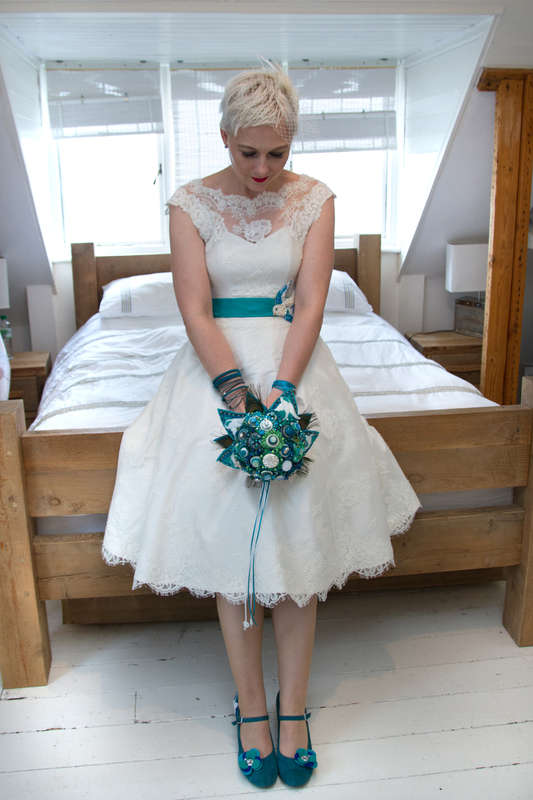 I was so delighted when the bouquets and button holes arrived. 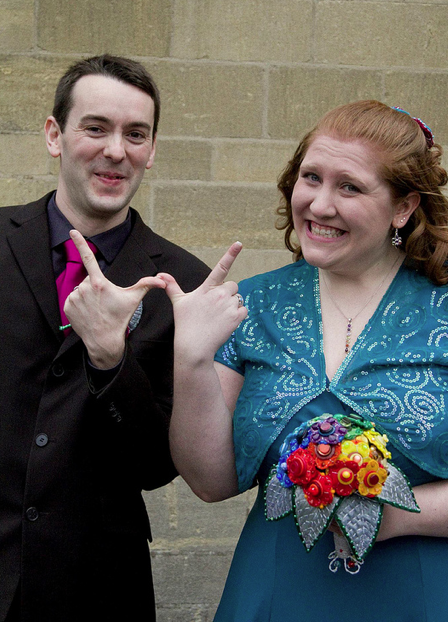 They were/are awesome and such lovely keepsakes of the wedding. The wedding guests loved the bouquets and button holes. They made our day just a little bit more unusual. I am so happy that I chose Jamball and miss their daily images. I would recommend them to everyone. Well, what to say? We met you at EWE and you were almost the last stall we saw. I had already begun emailing another vendor and had already had to amend my original idea to accommodate their designs. But there you were. With only a few months until the wedding I was so nervous about approaching you but you were both very helpful and listened to my ideas and the design process from there was a dream. The corsages and button holes were divine and look so great in the pictures. Everyone commented on how they complemented the other colours we had and it meant everyone felt like part of our team!I can't tell you how glad I am that we found you and how much we appreciate your patience and skills while we made decisions. The packaging was so sweet and really made it such an exciting box to keep. I'm struggling to put into words just how much I love my Doctor Who inspired bouquet and matching buttonholes and corsages. Jaime and Pete worked with me every step of the way and they are so attentive and thoughtful. When my order arrived just two days after it was sent out, I almost cried with pure joy. Looking at my bouquet, I feel like Jaime and Pete jumped inside my head and created exactly what I wanted! I love it almost as much as my fiance, but not quite! I honestly couldn't possibly overstate how happy I am. I would 100% recommend Jamball creations if you want a beautiful and unique bouquet for your wedding. Jaime and Pete were a pleasure to work with from day one. 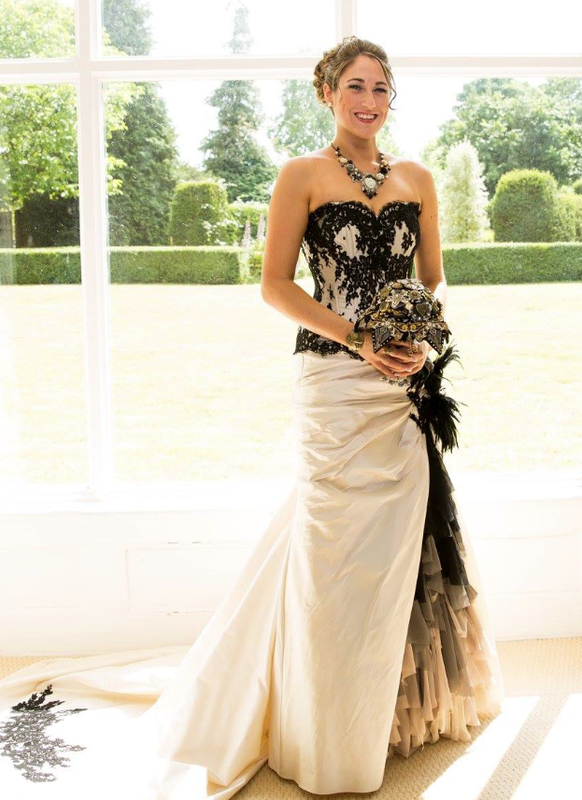 I first found Jamball through an internet search, looking for different types of felt and brooch bouquets. 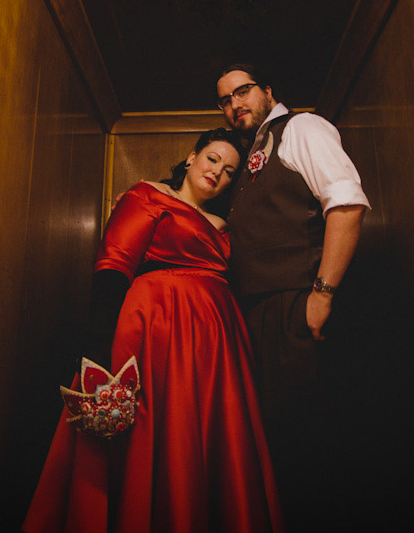 I was a little nervous at first about ordering based only on website pictures but from the first email I felt that Jaime and Pete were committed to creating the perfect bouquet for me. Throughout the making process they showed me every detail on Pinterest, allowing me to pick the brooches I wanted and alter colours so that I felt like part of the design team! I enjoyed the process and loved the products so much I even added to my order, having corsages made for the Mum's, so they could have something special to keep from our Wedding Day. I also asked Jamball for a new style of flower wand and within days my rough idea had been created, and was even better than I could have imagined. 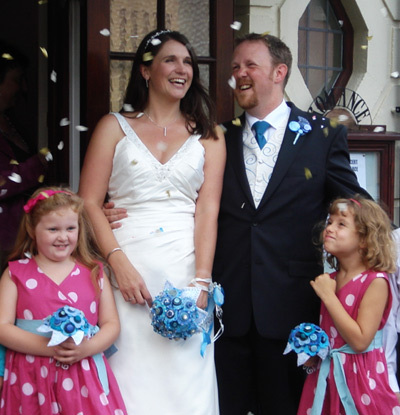 Thank you so much Jaime & Pete, the bouquet is such a lovely souvenir from our wedding, I will treasure it forever! I found Jamball when I visited EWE in March last year. Their stand was amazing, such beautiful, original bouquets and I loved their ideas. Jaime and Pete were lovely and approachable and very opened minded with regards to ideas etc. I always wanted something that we would be able to keep forever and to pass down to the kids if they wanted to use. From the outset they were fantastic. They just seemed to know exactly what I had in mind. It was so exciting seeing my bouquet coming together. It was perfect. 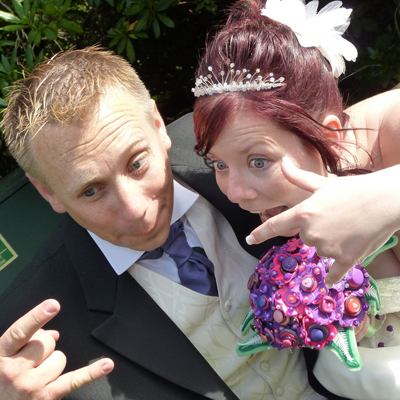 Along with my bouquet they also made Dave's candy skull corsage, ambers bouquet and wrist corsage, Jaden a mini version of Dave's skull corsage, Kiea a steam train corsage, Scarlett a giant lollipop and Sirus a Thomas the tank corsage. They were amazing. They were totally open to all my ideas and I certainly was not disappointed with the end results. We have had such lovely comments about all of the work that Jamball created and I cannot thank them enough for providing us with such special momentos. I would definitely recommend Jamball to anyone thinking of wanting something that extra special. They were very friendly, kept me up to date with how the package was progressing and we're totally professional. I cannot fully express in words how grateful I am to Jaime and Pete Ball, the dynamic wife-and-husband duo of Jamball, for the centrepiece of our wedding - my beautiful Technicolor bouquet inspired by the glorious stained-glass windows of La Sagrada Familia in Barcelona. From the first email exchange, they were eager and excited to work with me on making my vision a reality. When a very early iteration of the flowers wasn't quite what I envisioned, they were happy to adjust and carry on without any issues; they wanted me to be 110% happy. 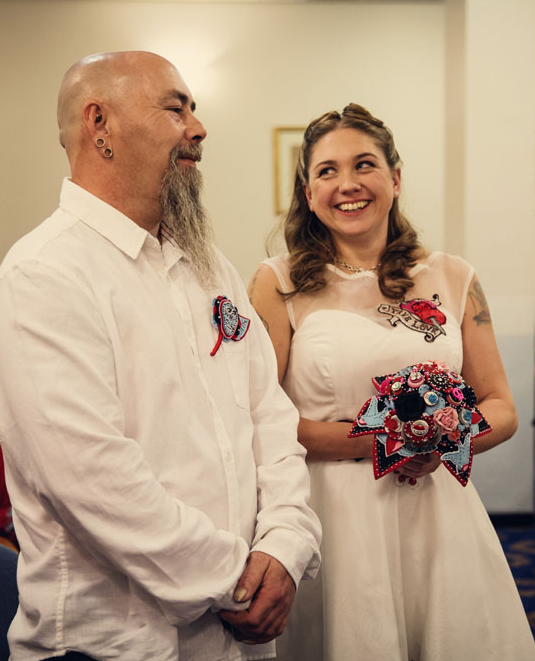 They also made beautiful boutonnieres, a special one for Kev, as well as for our parents, step-parents and witnesses, even making a wrist corsage for my witness so her little boy (who was only six months old at the time) wouldn't rip a pin off her dress! 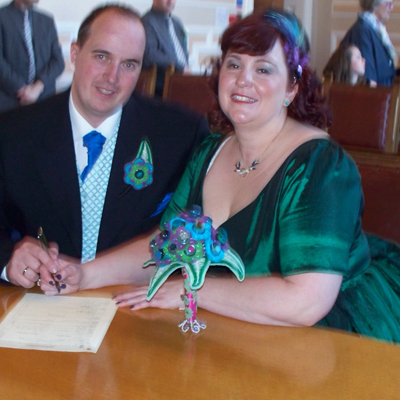 And as a last minute idea, they were able to put together a few hair flowers for me which matched the colours of my dress (teal with raspberry pink accents). 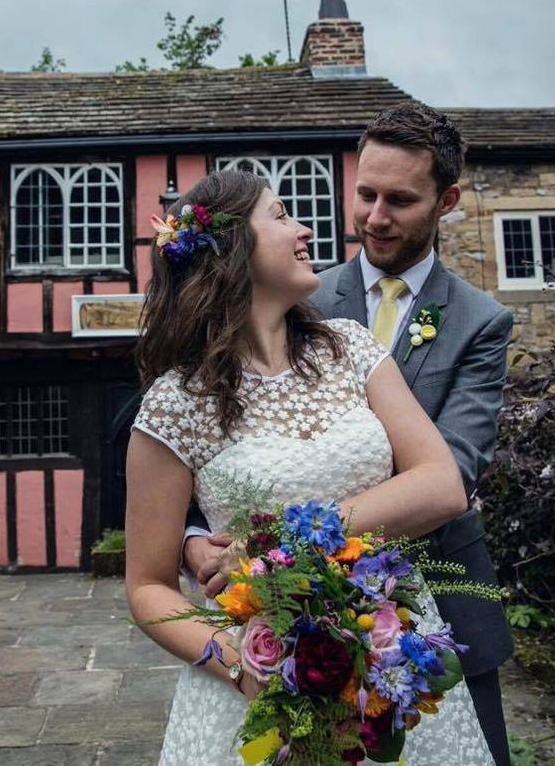 I received so many compliments about the boutonnieres, my bouquet and hair flowers, it was so nice and made me even more happy than I already was - it was only my wedding day, after all! 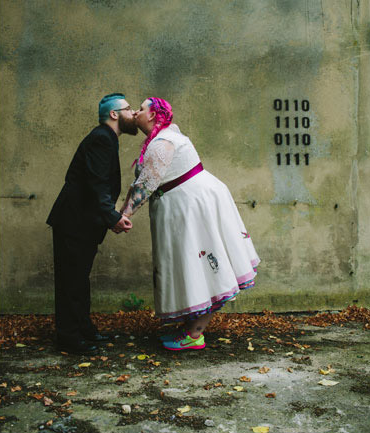 The photographs beautifully capture its gorgeous colour burst, you'd never think we got married on a chilly grey day in January! We got married on the third anniversary of when we first met, and we have just celebrated our 4 year wedding anniversary, and I can confidently say that my bouquet is just as beautiful today as it was then. 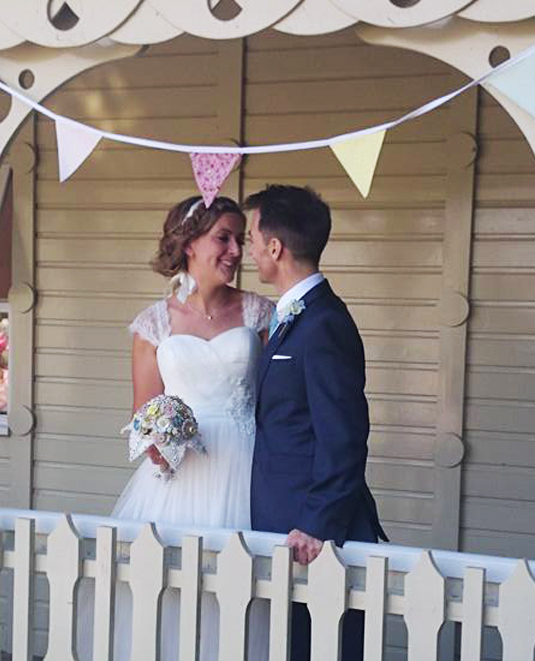 I couldn't bear the thought of spending hundreds of pounds on flowers that would only last a few days, so when I came across Jamball online, I knew that, along with the memories and photographs, I'd be left with a beautiful keepsake from our special day for the rest of my life. Jamball Creations used antique buttons and vegan friendly felt made from recycled bottles. 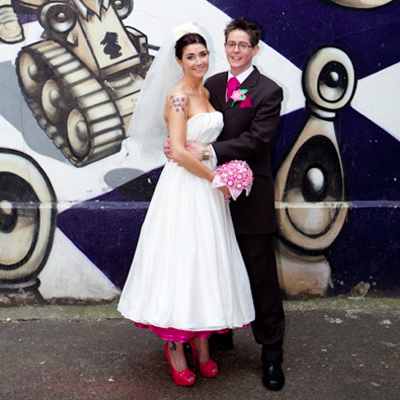 We met them first at the Eclectic Wedding Extravaganza and instantly liked them as people. We were impressed by their use of Pinterest during the design process (both for sharing ideas and work in progress) and delighted by the end result. For my wedding I wanted a bouquet that I could keep afterwards and had read about someone making felt bouquets in the US. I managed to find Jamball on Folksy and I am so glad that I did! From the start, Jaime and Pete were so helpful and listened to everything that I had specified. Their creations are truly fabulous and so original. I love the fact that they use old buttons on new felt. Jaime constantly updated me by email with photographs to show my the progress of my bouquet as well as button holes for our family guests. If I wanted anything changing, they were so flexible and adaptable. Jaime and Pete also created three simpler 'flower girl' bouquets and took photographs of their little daughter holding them so that I could get an idea of the size of them. My mum could not be with me at my wedding, as I lost her to cancer many years before, but I wanted a button hole made for her and felt a little bit silly asking Jamball if they could create this for me. They made me feel really at ease and totally understood why I wanted to do it. 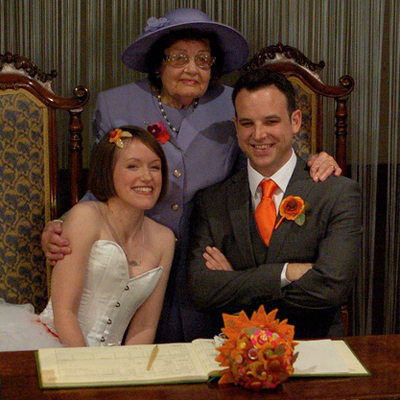 They created a very special 'mother of the bride' button hole for my mum which was more detailed than anyone else's and it sat next to a framed photo of my mum when we got married and during our meal afterwards. That really made my day. 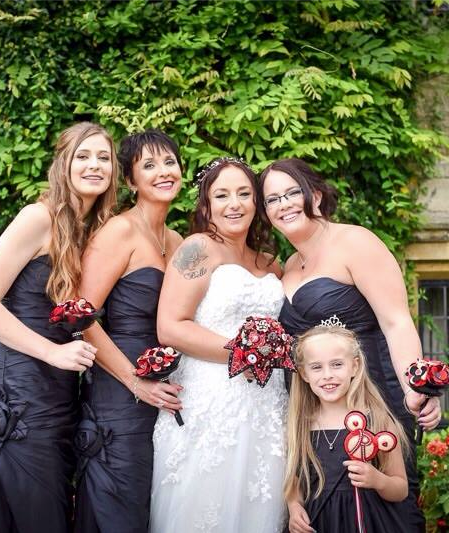 When I collected my bouquet and buttonholes, I was totally bowled over by the quality of their work. I couldn't have asked for anything better. It blew me away. They had also put two little heart creations in the box for me and Phil, an imaginative and thoughtful way of saying 'thank you for your custom'. I now have my beautiful bouquet sat in a glass bowl in our living room where I can look at it to remind me of our amazing weekend in Southwold with all of our family. Getting married and all the planning that goes with it is pretty stressful! I am sure any of you going through this will agree….. I married my gorgeous fiancé in August and in the months leading up to the wedding was planning details of our day. 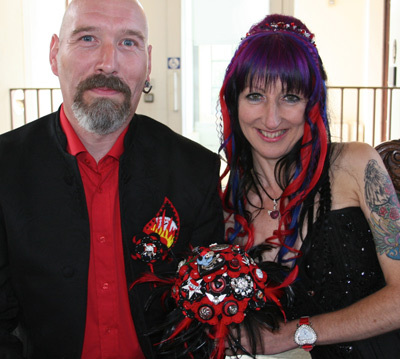 Our wedding theme was somewhat different – a definate red and black theme – my flowers were going to be a major part of the whole theme and the look I wanted – I knew in my head what I wanted… but certainly had not seen anything to match my ‘vision’. I am absolutely delighted that I discovered Jamball and Jamie & Pete Ball – I contacted them via e-mail and then later by phone and described the ideas I had. They were fantastic at putting my thoughts and ideas into reality – very quickly getting a real feel for what we were looking for. We communicated via e-mail and occasionally by telephone – I was included and consulted with every step of the way – I was sent photographs at every stage which was wonderful as I really felt part of the whole experience. The end product exceeded all my expectations – it is absolutely gorgeous – and perfectly fit with the whole feel of the day – everybody was stunned and the absolute best thing is that I know it is totally unique to me and our wonderful day – and also we can keep it forever! 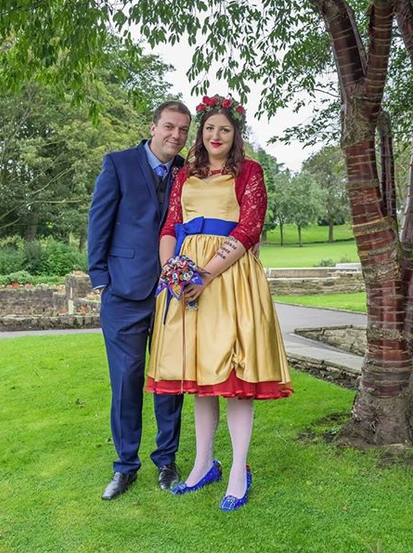 We also had a fabulous corsage/buttonhole made for my fiancé – which was a total surprise for him and he absolutely loved it – again Jamie and Pete just knew from our conversations exactly what we wanted. I wholeheartedly recommend Jamball – their professionalism, excellent customer care and excellent communications was second to none. Fabulous!! AMAZING, WONDERFUL, BEAUTIFUL their work is stunning and their communication is on the same par. I have found both of them to be wonderful and caring, putting up with all my niggly questions and making my wedding bouquet in excellent time and excellent quality! Have recommended to all my friends! xoxo thanks guys!! !